Qtoktok is a native on a South Pacific island. 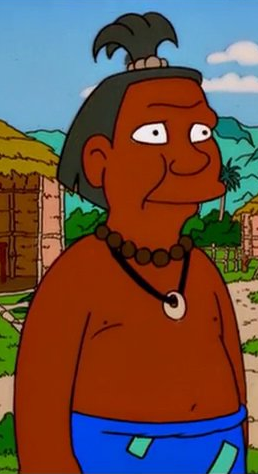 When Homer arrives at the island to work as a missionary (replacing Craig and Amy, the previous missionaries), Qtoktok, Ak, and Lisa Jr. are the first natives that Homer meets. When Qtoktok and Ak interact with Homer, Qtoktok takes the lead and does most of the talking while Ak acts as his side-kick. For example, when Homer sees two sarong-clad women and asks what happened to all of the shirtless girls, Qtoktok provides a detailed answer: "Craig and Amy gave us the gift of shame. All the naked women are on that island." Qtoktok then points at a distant island. Ak simply adds, "Yeah, anything goes over there. Bouncy, bouncy!" In general, Qtoktok appears to be a leader. He is polite, considerate, knowledgeable, and is usually open to new ideas, such as when Homer confesses that he really just works at a nuclear power plant and Qtoktok asks him to tell his people all he knows about nuclear power (which is nothing). When Homer has his casino built and sees the horror within it, Qtoktok is shown somewhat drunk, but is aware that Homer's alcohol and inexpensive buffets have corrupted his people. He also claims to not like macaroni salad, but continues to gorge his face in a bowl of it. However, Qtoktok quickly reverts back to type when he sobers up. To make up for having built the casino, Homer starts working on finishing the chapel that Craig and Amy had started building. Qtoktok takes the initiative and suggests that maybe the islanders should help him, even though Ak states that maybe he should shut up. When Homer tells the islanders, "Now grab a stone or go to Hell," Qtoktok is one of the first to pitch in and help. When the chapel is complete, Qtoktok asks how often they need to go to church to avoid hell. When Ak claims that they must go every Sunday for the rest of their lives, Qtoktok takes it as a joke. Modified on January 26, 2017, at 07:45.